You don’t need to get a degree in interior design or spend a fortune on furniture and decorating to have a stylish, modern living space. That’s because once installed, contemporary-style fireplaces like the Heatilator Crave Series easily become the focal point in any room, setting the tone and mood. And now you won’t have to break the bank to get one. Heatilator, the first name in fireplaces and the #1 preferred brand by builders, recently introduced the Crave Series of Direct Vent gas fireplaces – a new linear line that offers modern luxury at an affordable price. 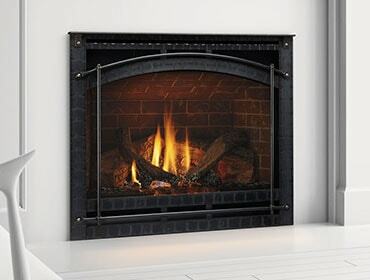 Available in four sizes, the Heatilator Crave fireplace perfectly reflects the trend for clean modern designs with a linear shape, flush to the wall installation, and low-profile trim. It’s available as a single-sided or a see-through fireplace that’s viewable from two rooms. Big, beautiful flames rise from a bed of glass media and span the full length of the linear fireplace, reflecting softly off the black glass interior. It has many customizable features for mixing and matching to your style preferences. Yeah, it’s got beauty. But it’s got brawn too. The Crave comes standard with Heatilator’s IntelliFire™ Plus Technology with on-demand ignition instead of a standing pilot light. It helps ensure safe operation for your family and can save help save up to $10 per month on energy bills. That’s in addition to a full-featured remote control, Direct Vent technology for clean, safe indoor air quality, and duct technologies that can redirect up to 50 percent of the Crave’s heat to another area in the home. So check out the new Crave Series! It’s the first customizable linear modern fireplace that has all the quality, durability and efficiency that you expect from the Heatilator brand. You can see the Crave in action here. If you like what you see, start your home’s transformation by finding your local dealer.